If you’re familiar with common Taiwanese lunches, you’re familiar with the relish or topping that comes on nearly every one. With Pork Chop over Rice, Chicken Leg over Rice, Lou Ro Fan (Chopped Pork Rice), or Beef Noodle Soup, you get a nice heaping of Pickled Mustard Green Relish. Still, I never find it to be enough and always ask for more. To me, it’s the best part and makes every one of these dishes better. It’s sweet and sour, and the very crunchy little bits add fun to every bite. (Some make it spicy.) 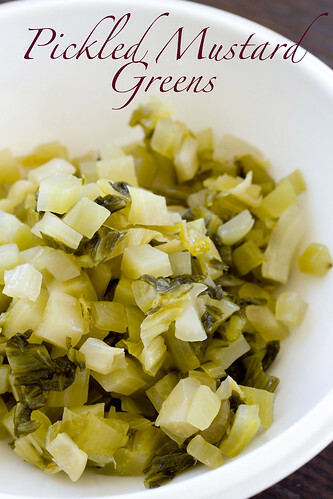 Often used as a counter-balance to fried or fatty meats, it really lightens and brightens each mouthful. This wonderful pick-me-up is fast and easy to make and stores well in the fridge. 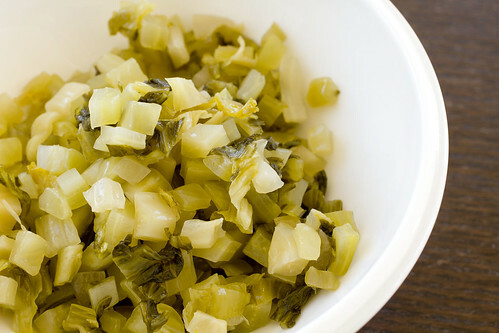 You can make it from store bought pickled mustard greens or you can pickle your own. Now, guess which dish is coming next? 1. 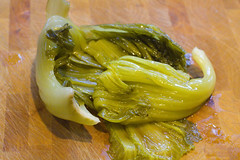 Press or squeeze out excess liquid from mustard greens. Set aside. 2. Heat oil in a wok on medium high heat. Add mustard greens. Stir and toss. 3. Sprinkled with sugar and continue to stir and toss. 4. 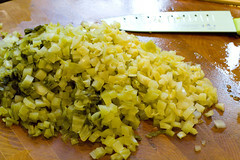 Taste and add vinegar if necessary (depends how long you pickled). Add chilies if you want. 5. Cool and serve. (Serve cold or room temperature.) Store in an airtight container in the refrigerator. Keeps for several weeks. posted by jessica	at 08:13 PM	Filed under Chinese, Recipes. You can follow any responses to this entry through the RSS 2.0 feed. Both comments and pings are currently closed. Oh my, I’m loving this recipe, Jessica! My mouth actually started to water, wanting that sweet/sour taste! You are really a DIYer — good for you! I love to eat this but have never considered making this and most Asian condiments myself…until now. Barbara and Xiaolu, if there’s one to DIY, this would be the one! It’s so easy and it’s the best!! I love pickled veg! It’s so appetising! A must for Lu Ro Fan!